Hello! It’s been a busy month with everything going on, but I wanted to make sure I came on here before I left for Italy in a little over a week from now. We are busy getting things all pretty and packed up as well as preparing for our classes, and I wanted to share with you a glimpse into our week in Bellagio. This is a little SNEAK PEEK into some of the little ephemera packs I put together for my classes. Below are two of the classes that will be taught by Sheila Atchley in Bellagio, Italy for our October Art & Faith Creative Retreat. All the classes are available to register for on the SIGN UP PAGE, under REGISTRATION now! The first class for Sheila Atchley will be her Altered Tin Class. This will be taught on October 8 starting at 9:30am. Cost is 50 Euro’s and you need to be local to Bellagio, Italy because this is not an online class. We will have a break for lunch, and then continue afterwards to finish this beautiful art tin class. Class will end by 4pm. 2. The second class with Sheila will be held on Wednesday, October 10 at 9:00am. We will meet in San Giovanni to enjoy a Plein Air class as we walk and enjoy the surrounding beauty of Bellagio. Cost is 35 Euro’s & Class will be over at 12:30pm. 3. I will be teaching classes during the week as well, and they will start with a class on Sunday, October 7th with Bible Journaling 101. 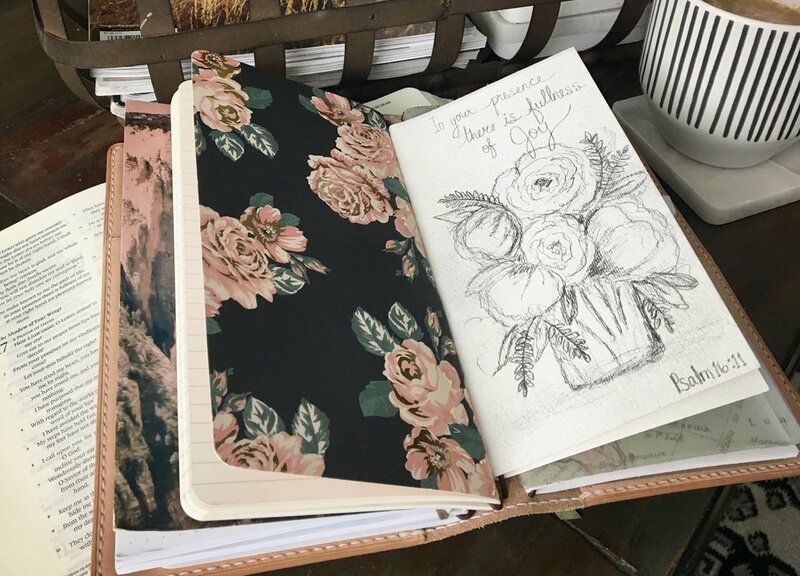 This will go into detail about the heart behind this new “art form” as well as share with you the art products that you can use in your bible safely and delve into the worship aspect of Bible Journaling. Cost for this class will be 30Euro. (and again, you need to be in Bellagio, Italy to attend) This class will begin at 10:30am but you are welcome to join us at 9:00am for a time of worship and devotionals to start the day! Please Note: Picture below is just an example of Bible Journaling, not the actual pages we will be working on. 4. On Wednesday, October 10th, after Sheila’s Plein Air class, I will be continuing to teach Bible Journaling. This class will be more in depth and if you have done Bible Journaling before and want to have time to delve into more techniques and just have time to devote a few hours to it, please join us! This class will just be a fun time of listening to the Lord’s promptings in His Word and journaling in our bibles. Cost will be 10 Euro. 5. On Friday, October 12th I will be teaching the last class & it will be a Traveler’s Notebook Class. This is a FUN way to journal and keep notes on ANY subject in one place. (Just check out the hashtag #traverlersnotebook on IG and you will see a whole new world! :) This class will come with a Brand New, HANDMADE… ITALIAN LEATHER Traveler’s Notebook!! Yes, I am having them made by hand by our favorite leather maker in Bellagio! It will come with the inserts to go with it and a fun package of ephemera to get your started! I will teach the basics on how to use this system and we will be creating ART and documenting LIFE in our BEAUTIFUL new notebooks. Cost is 85 Euro’s as you will be given a handmade leather TN along with the class. NOTE: For this class & afterwards, I will have some extra Traveler’s Notebooks and will be selling them online after I get back from our time in Italy. I will give a SNEAK PEEK on the actual TN’s tomorrow! Ok, that’s a FULL load of classes and I know everyone joining us is super excited about them. We hope if are you local to Lake Como you know you are very welcome to join us in one or all of the classes! It has always been my heart to open these retreats to the local woman to join in our time together and to encourage community through these retreats. It has been a huge blessing to see the relationships that have started through this with women all over the world! We can’t wait to meet you soon! So much going on these days... that is all I feel like I am doing lately. We are getting granuliar on the home and "Gathering Place" plans for our land and have been in meetings every day this week! Who knew every little door hinge, drawer pull and "can or not to can" on your lighting were things we would have to decide? First is the fireplace area in the great room. Trying to decide between black, white or red brick for the fireplace area and we decided on white! With the black windows and French doors on either side we think this look will be best. These doors will be on both sides of the fireplace... if we can find the space! The dimensions were a little off for the fireplace and doors in this space so we are hoping they come up with a solution that doesn't add $$$ to the equation! Next was picking doors, door handles, drawer pulls and front door handles... etc, etc. So fun. NOT. The last two days were meetings with the home builders Interior Design Team that they use in town, Quail & Blu. LOVE THEM! I think I want a job there... This reminds me of my Interior Design days in Newport Beach many moons ago. But this part is FUN. Picking out the elements of the Kitchen, Master, Mud Room and Pantry are things we have Pinned for many months and we finally get to DESIGN the spaces! 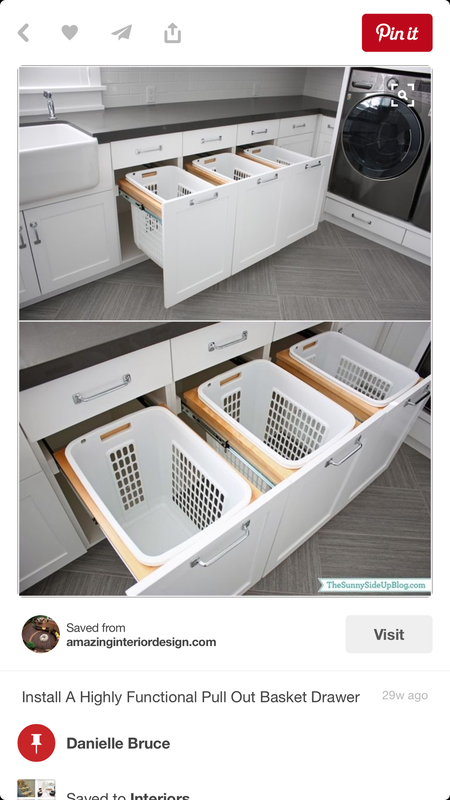 We have a huge Mud Room and a Pantry that I got to have a field day designing! The pictures below are the Mud Room. We have one end that will have black built ins, then the flooring we picked is below this photo. 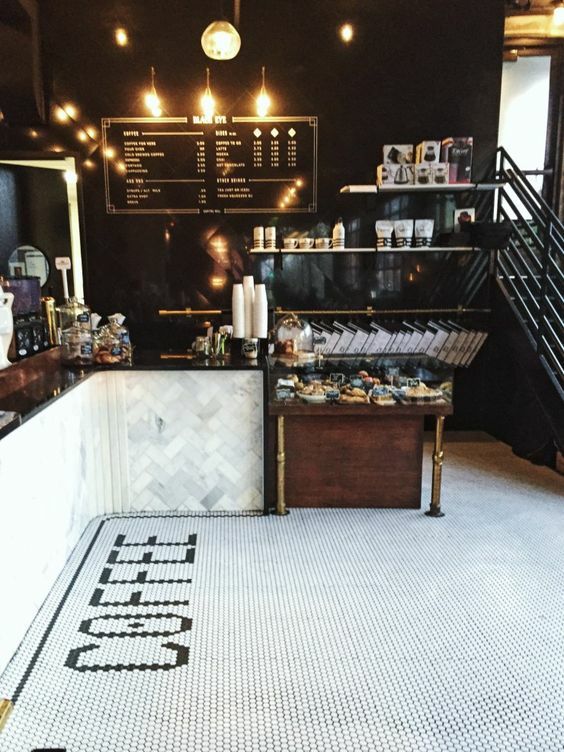 isn't this tile a DREAM?!? I'm having "Tiny" build out the sink below in the mud room. (I can't wait to meet Tiny... don't you think he's not going to be TINY? lol) I will give tiny a BIG hug when I meet him! Since the Mud Room will also be my Art Space until the Barn is done, I made sure there was room for my art supplies and a desk and art easiel. I LOVE this old barn sink!! This is a LOT of planning. a LOT. I have a love/hate relationship with this and I know that's probably normal. What I don't want to get distracted by is the overwhelming sense that you could get so drawn into THIS that there isn't time for JESUS. That this unbeliveable DREAM HOME He is allowing us to plan for is INCREDIBLE... is an understatement. I am in tears every time I sit and ponder that. (like right now as I'm writing this... ugh) I just don't want all of THIS to become more important than the PURPOSE of this land He has given us. It's a fine line and I just don't want to be on the wrong side of that... Please Lord. Last night I was PLANNING another thing... the Itinerary for our Art & Faith Creative Retreat next month in Italy! Like I said... there is a LOT on my plate right now. And in the middle of that planning I just felt like I needed to STOP. The Lord literally put it on my heart to put my pen down and stop. Take some time to step away from planning and PRAY about it instead. I am SO grateful for what I GET to do, please don't get me wrong! I have 1st world problems and I know that! So in that though, sometimes I question why I can't just have a house picked out for me and I'd be happy to LIVE in it! (Yes, I know we could have just bought a house on some land and called it good) BUT... God. I know the WHY. He has combined ALL. MY. LOVES. into a life I can't believe I am blessed with. BEYOND Measure... and it's BECAUSE of the desires HE puts on our hearts that we are BLESSED with those amazing paths He puts in front of us... AND in that, they are also a responsbility... to be used for His purposes. I was having coffee with an "online friend" who became a REAL "in-person" friend this week! She lives in Colorado Springs and we met for coffee!! It was so fun and it made me realize that the Lord has given us SO many connections here for a PURPOSE. He is weaving it all together. I was telling her all that God is doing and planning and that it IS AMAZING. I am in AWE of it all! From the outside lookng in (aka Social Media) it isn't always the whole picture though. FB and IG have a way of making us think life is SO easy for people?? I want to be as open as possible here. I am CONFIDENT that the LORD has moved us here for a REASON and my retreats are for a PURPOSE... and I think He is blending ALL OF MY LOVES into this PURPOSE. But with that... comes the enemy wanting to tear that down, right?! It's just the honest truth. Stress, doubt, health issues, etc... are things that try to block us on that path. We can, AND SHOULD, plan things! It's not BAD to plan and have wisdom and prepare... Those are all biblical. What we/I need to be reminded of is that we can plan, but ultimately whatever the Lord purposes in our lives... THAT will stand. That will take place and be RIGHT. Having our focus on the Lord 1st and all the other stuff next... that is what I pray for, for everyone. To SEE the reason and/or goal of our lives is to be living for His Glory. I will update you soon on next years Creative Retreats because we are very excited about 2019!! Italy Retreat this October... One spot opened up! One last spot has opened up for our Art & Faith Creative Retreat this October 6-13! If you’ve been thinking about joining us... it’s not too late! This is an incredible opportunity and such a gorgeous time of year to visit Lake Como. You can message me for pricing and details via the contact page at the top. I’ve just heard from Laura Hogue McCollough, and you guys...there is ONE spot left for the Art and Faith Creative Retreat in beautiful Bellagio, Italy this October 6-13! We hope you will prayerfully consider if the Lord is calling you to join us this October in Italy. I promise if He is, you will be blessed by this week away to be refreshed and renewed in your faith. Love, Tuesday... Moving in day! We have called the PODS to come bring our stuff on over... and tonight we get to sleep in our own beds!!! We have been "glamping" in our new rental home for the last week. It has been nice to be settled and getting familiar with this new home and city, but BOY oh BOY will it be nice to have a sofa to sit on and beds to sleep on! We love Colorado and have already seen a lot as we drove through the state to get here and as we've explored the surrounding cities this past week. To think and reflect on this past year, even though there is not much time for that right now, I treasure the time I took to journal this whole process. Looking back on what the Lord has shown us and spoken to us and moved us to do... is BEYOND my wildest dreams. We had NO intention of moving to Colorado people... We were just finished putting SOLAR on our beautful home! lol BUT... the Lord had other plans for us and I link that back to when we started a 40 day prayer circle at the beginning of last year. It opened our hears and minds to what is possible WITH GOD, when you allow your lives to be open and used for His Glory. So here we are... unpacking for this new adventure the Lord has us on. It has been so clearly evident that we are supposed to be here. So now it's just a matter of waiting on God's perfect timing for the loan of this new home and Gathering Place, and trusting that He will continue to open the doors when He wants us to walk through them. We had friends come over with breakfast, and then again bringing Ice Cream! We've checked out several antique stores in the area and some GREAT restaurants as well! 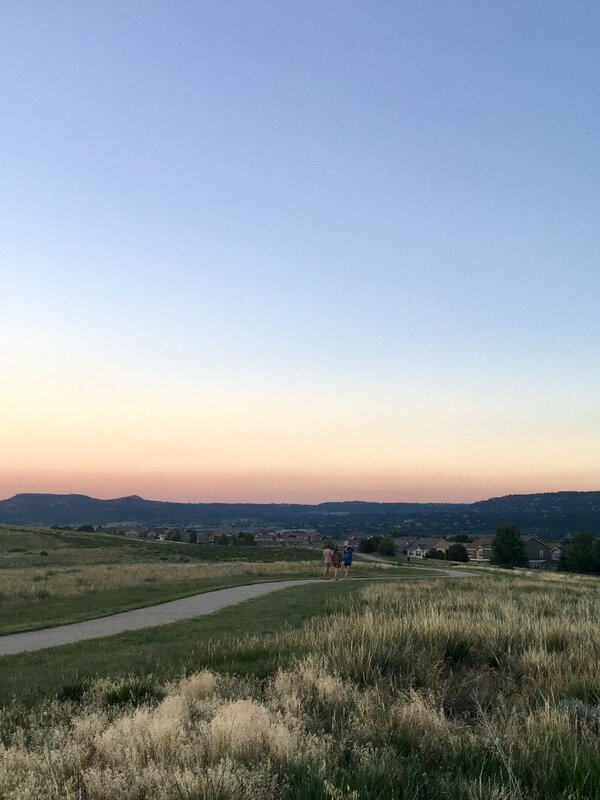 We've walked and walked and walked at Farmer's Markets, in Denver, in our town and on a beautiful path right outside our doors! We've had friends over for our first get together in our home for the next year and walked with them to their old house, which is in our neighborhood! And now we are settling in to our work on the new home and have meetings upon meetings upon meetings. It's a LOT to build a home and we are praying for wisdom and discernment in the process... because there are SO many decisions! So today we meet again and go over all the tiny details on the floor plan to make sure we understand it all. Then we will enjoy some time with Rebecca before she goes back to college! This is weird... we lived only 15 mintues from her college and now we are shipping her off on an airplane to college! These two are MOVING to Colorado AND... are expecting their first BABY! Yes, we get to be grandparents! We are so blessed to have them moving here and starting a life here! We are 6 days into our Paris & Bruges 10 day Art & Faith Creative Retreat! It has gone by SO fast, I can't believe we all arrived last weekend and it's already almost the weekend again. Well anyways, I've realized that the next retreat here (in 2020) will have to be a bit smaller because they just don't like to accomodate that many people. I'd share a story about Ralph Lauren's hostess at his restaurant... but I won't. YIKES. Thankfully these ladies have been so great and have really showed so much kindness and love everywhere we go! In fact, they totally turned the situation around at Ralph's and even the people at Ralph's were won over and ended up accommodating us in their beautiful terrace! Yesterday I did something that moved me to tears... a devotional in front of Notre Dame. I can't explain how moving it was to stand in the shadows of this beautiful Cathedral in the literal center of Paris, with such history, and talk about HOPE in Jesus Christ! Then we all went inside for about 10 mintues and took some time to pray on our own or just sit and feel the Lord's presence. It was something I will never forget. Saturday we are onto Bruges, Belgium for the last 3 days of our retreat. We are already sad just thinking about having to say goodbye to all these women! What a JOY it has been to do another Art & Faith Creative Retreat. We are so blessed to share our lives with so many wonderful people each time. This group is already family to us. Thank YOU for believing in us. That you come along with us and travel far to get here means so much to us! We love what the Lord has given us to do and we are so thankful for the people we cross paths with. This summer the theme of both retreats has been HOPE. I can't believe the connection each woman has had with that one little word! It's amazing to see how we have bonded over our faith and gained strength from each of our experiences in life. What the Lord is weaving together through these retreats is just incredible. So in AWE of our God! I'm a little sad to say that we don't do Paris Art & Faith Creative Retreats every year... but we are excited about our Venice and Bellagio, Italy one next June. If you are interested in finding out more details on our retreats, please don't hesitate to contact us! We are more than happy to answer your questions, and we look forward to meeting you some day at one of our retreats. P.S. Art class in Luxembourg Gardens?? YES! What a great class with Stacy Stultz in this beautiful location, learning about Rodin and sketching in our sketch books. NO, you don't need to know anything about art, the artists we study or how to hold a paint brush! We have every level of artist join us on our retreats. It's a beautiful thing to watch the process in each person as their Creative spirit comes out! (yes, I believe we are ALL creative... because we have been CREATED by THE CREATOR!) So don't feel intimidated to join us at one of these retreats, we are just wanting you to prayerfully consider joining us and the Lord will put that on your heart if you are supposed to be here. Come join our Summer 2019 Art & Faith Creative in Italy! We invite you to enjoy a week away... to step away from life and be RENEWED and INSPIRED. To relax and enjoy time being creative in beautiful Italy. Jeremiah 31:25 says: "For I will satisfy the weary soul, and every languishing soul I will replenish." Our prayer for everyone who joins us on our Art & Faith Creative Reteats is to seek out that time to be renewed in your faith and refreshed in your spirit. This retreat will start off in Venice, Italy where we will explore this incredible city of canals and bridges. We will enjoy all the important historical sites, but we will also share with you the hidden parts of Venice that capture the true heart of the city. Then we will be transported to Bellgio, Italy "The Pearl of Lake Como" where we will spend a week feeling like we've stepped back in time to the Italy we dream about. We will wander down cobblestone paths that lead to lakefront gardens. We will create ART in beautiful settings that INSPIRE us. We will enjoy delicious meals with new friends, and draw closer to the Lord through Art & Faith. This is where we will meet by the lakefront upon arrival, enjoy our classes taught by inspiring teachers, spend time exploring incredible villages around the lake and find time to relax, be refreshed and leave renewed. - Classes in the beautiful event room by amazing Artists! - FUN SURPRISES I can't reveal yet…but they are AWESOME! - Plus time to relax, stroll the cobblestone streets and enjoy LOTS of Gelato in Italy! - And…an unforgettable experience in Italy you will treasure forever!! REGISTRATION WILL OPEN THIS SUNDAY, JULY 1ST, 2018! PLEASE CHECK BACK ON SUNDAY TO SIGN UP. You can sign up BELOW, or it will be under the SIGN UP button at the top of the website. Simply click on SIGN UP and the drop down menu will appear. Click on REGISTRATION and it will take you to the page to sign up. You can let us know in the comments section of the SIGN UPS if you plan on joining us for just the 7 Nights in Bellagio. Please feel free to email me with any questions you may have or contact me via the Contact Page above. We hope to see you at the next Creative Retreat! Well, we are back in Italy and enjoying beautiful weather on Lake Como! This is the week of our Art & Faith Creative Retreat here, and we have welcomed another group of people here for a beautiful gathering in Italy. I am still amazed at how the Lord orchestrates each person who is here and how there is a reason for each and every person to be here. The theme this year the Lord gave me is on HOPE and it is already evident that God's divine wisdom is in this and that HE truly does get all the glory for ALL of it. I am blown away at how just in a couple days we can see Him working in the lives of the people here and how this place is truly a place that gives rest and peace. On the first day we welcomed everyone lakefront on the pergola of the hotel and enjoyed the perfect weather before we showed them to their apartments. Sunday is usually a very relaxed day with a tour of Bellagio with Rita, our dear friend and tour guide of Lake Como, in the morning. Then it's time to REALLY relax and enjoy this amazing pool and lake all afternoon. While everyone was enjoying all of this, Rebecca and I got into the event room and prepared it for our classes that start on Monday. I still LOVE this room and it's views out all the windows of the amazing lake. I know it may seem hard to stay inside when that view is beckoning us, but the classes are always so much fun the ladies don't mind it at all. Plus we really try to balance the week with classes, free time and exploring all the beauty around the lake. Here's a little sneak peek at one of the classes we started today! Tomorrow is a day for getting on the lake and exploring another village. 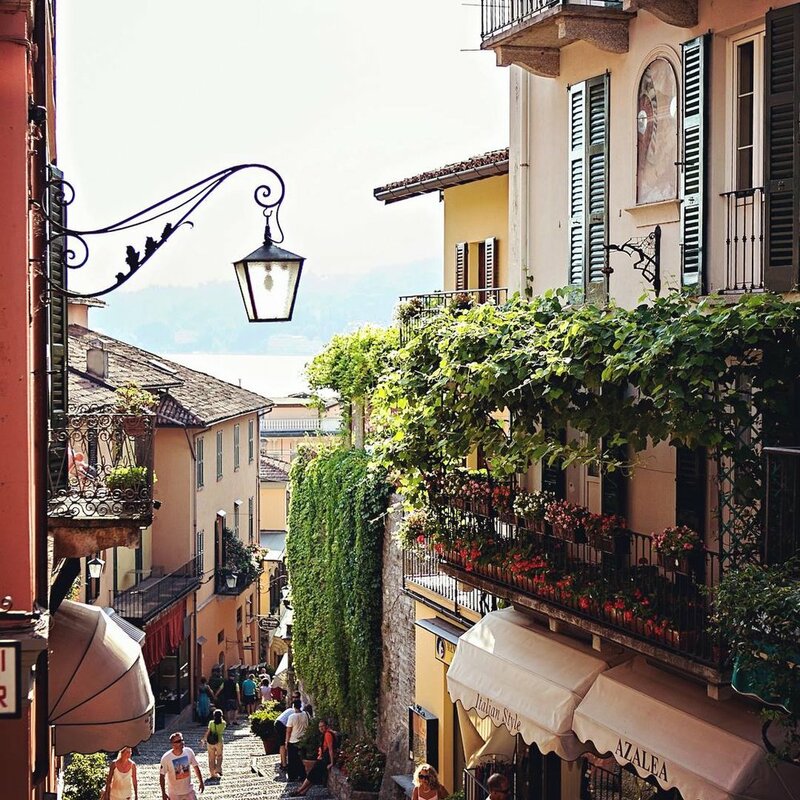 One of our favorite places to visit is Varenna and we will be walking through the town to the Monastery there and then enjoying a beautiful afternoon lunch before heading back to Bellagio for a Cooking Class. We also have a retreat NEXT YEAR and all the details & pricing we be on the blog in a few days. We'd love to have you come with us as we host another ART & Faith Creative Retreat next June. Our plans are all set and we are excited to announce some exciting new things! Our retreat next summer will have the option to start out in VENICE! We will be exploring one of the most unqiue and inspiring cities in the world, Venice, Italy for 3 days before we head north to Bellagio for the weeklong event here. Registration will be open this coming Sunday, July 1st for next years retreat! If you want to join us, you can come back here on Sunday and click on the SIGN UP button at the top of the website and you will see the image for next summers retreat and once you pay the DEPOSIT, you will be sent an email confirmation. Or feel free to email me via the Contact page at the top of this website if you have any questions. I will try to answer them as soon as possible, but the time change may make it a bit delayed. We truly pray each year that the Lord will let this be part of YOUR story. We hear such incredible stories of how each person came and what reasons behind this trip made them come. So prayerfully consider joining us and we look forward to meeting YOU in Italy next summer! If you are here because of our mutual friend Jeanne Oliver, thank you for coming. Jeanne is one of the most creative and generous people I've ever known and I am blessed to call her friend. We met many years ago while teaching at an event in L.A. that Kim Caldwell put on. It was one laugh after another that weekend and our friendship has grown from there. I asked Jeanne to teach with me in Italy the following summer and she has now been back 4 times to Bellagio for our Art & Faith Creative Retreats. Last summer when she brought her whole family with her, we had such a special time together that we planned up dreams for another one some day! But she also opened up her heart to share a friend of hers with me, and she connected Sheila Atchley and I last summer while in Bellagio. We casually started getting to know each other via FB and IG, but what I saw was such a deep love of the Lord in Sheila that I had to get to know this woman more. She not only has a connection with God that you don't find very often, but she has such an amazing way of speaking His truths in ways that are so beautiful and raw, that go WAY beyond me. You THINK when you listen to her... in ways that really stretch you. I know I want to learn from her and grow in my faith through her insight into God's Word, and so I invited her to teach THIS October with us in Italy! This time of year is so beautiful watching the leaves change on Lake Como. Not only will you be surrounded by beauty everywhere you look, this week together with Sheila will be a time to step away from life and draw closer to the Lord. Through Art, through time in the Word of God and also just through strolling the cobblestone streets and taking in the beauty of God's creative world! I hope you will ask the Lord what He has for you here. I always pray that He will bring the women who need to be there... and He does. Maybe you need to step away for a week to be RENEWED. Maybe you need to be there to meet someone that will forever be in your life. Maybe you need to be encouraged and given HOPE again. I am telling you there is a reason the Lord brings EACH person, and it's so humbling to watch each and every time how He knows you need this gift of TIME. There are a few spots left for this October and I know if the Lord is calling you to this, He will make a spot available for you, even if it's a decision you make at the last minute. I can't wait to share this beautiful place in Italy with you... and I know Sheila is ready to meet you here as well. Well, the last month just FLEW by... BOXING UP A WHOLE HOUSE! Sorry I haven't been blogging and filling you in on the process. It's just been a month of packing and working non-stop. Isn't it amazing how much "STUFF" we accumulate over the years. At least in our case... I realized it's WAY too much! I've also been thinking how this move affects each one of our family members. It's been interesting how we have all dealt with this big move. We ALL are excited about this next chapter, but it comes with so many emotions. Happy to leave California. Sad to leave friends and family...(we leave behind Victoria and Dany, and Rebecca while in college) and we can't forget our church "FRAMILY." Scared for the unseen. BLESSED beyond imagination that THIS is our path. Tired beyond tired. The list could go on and on... But I don't think I've had time yet to process it all since there just isn't time to sit and reflect. It will hit me when I pull out of the driveway for the LAST time, and hit the road to Colorado. Then the waterworks will definately be flowing. Yesterday the loaders came to load the Pods and ALL I wanted to do was sit in my backyard and enjoy the beautiful roses that finally bloomed! I have to say that this has been one of the hardest things I've ever done. Not necessarily the hardest thing I've GONE through, but definately the hardest work I've had to put in over months and months. To pack up a house takes SO much time and effort and back-breaking muscle. And then on top of that to be planning a new home build in a different state and having to go back and forth the last few months. On top of all of that, having 2 retreats this summer in Europe... and planning for next years. WOW. But through it all, I have experienced the most amazing GRACE and PEACE. It's so amazing for US to sit back a little and watch the Lord moving. I feel like WE are bystanders in this in some way. I know so many people are praying for us, following our move and encouraging us in so many ways. So THANK YOU. But truly we feel like God is driving this whole thing and He has given us so much through it all. He truly does supply all our needs. The night before the move I was just DEAD. Like I could not do another thing. But I just layed on the floor and cried out to the Lord for help. There was so much more I had to do, and I just couldn't. But God. He got me through. "God also supports who we are and who He has designed us to BECOME." That's IT! I feel supported... I know this move is Him moving us closer to who He has designed us to become. What He wants us to do. So I feel that support from the Lord and ALL of you... and THAT is how we can do this! Deuteronomy 33:27 "The eternal God is your refuge, and underneath are the everlasting arms." I wish I had time to journal that verse in my bible, but some day I will when this is over and it will remind me of this time I FELT those everlasting arms. You heard it FIRST! I'll share more details next week... but 2019 is going to be a GREAT summer! Hi everyone. I wanted to let you know my email that is connected to this blog has been giving me issues. I have had people tell me that when they email me it says my "inbox is full" and their emails are not going through. Today we are showing our house and need to be out of the house most of the day, but I will respond as soon as I can with any emails I recieve.